Like other industries, the art world should come under the scrutiny of fair and equitable business practices. With so much privatization in the gallery and museum world, it's as good a time as any for consumers of culture to question where funds come from—and where profits are going. This summer, we're seeking out the best not-for-profit and community conscious art spaces in the most commercial cities on the global art circuit. As part of our mission to give art a social slant, the fourth stop in our series exploring these venues is Berlin. Be sure to check out our Los Angeles and New York City and San Francisco guides too. Berlin expresses its art scene in many different forms. Different spaces, missions, and structures. This is about the impact of non-profit spaces and the purpose they serve. Though market-driven galleries are growing in prominence, some non-profits have risen to great importance. KW, for example, started as a small artist run non-profit space and is now one of the more influential in the city. The following are some non-profits with varying missions, each at a different age and at different levels of maturity and influence. They’re listed in chronological order. Though private and commercial institutions are very much alive and well in Berlin’s art scene, some of the capital’s staple venues are actually not for profit, dedicated first and foremost to developing local and international talent and serving it to the city’s culture-hungry community. From juggernauts to holes in the wall, non-profit art spaces in Berlin add unique and significant voices to the conversation, often by injecting a particular philosophical and sometimes philanthropic element directly into the space’s organizational structure. Starting with the veterans and working toward the up-and-comers, get to know the various reasons why some of Berlin’s art leaders put profit on the back burner. Located at the heart of Mitte’s Augustrasse art thoroughfare, The Kunst-Werke Institute for Contemporary Art—or KW—is probably one of the city’s most recognizable art institutions. Founded in the early 1990s by Klaus Biesenbach and a collective of young artists, the group transformed a dilapidated former margarine factory into an establishment that’s become a testament to Berlin as a vibrant key player in the international arts community. More than just an exhibition space, the KW complex hosts exhibition halls, offices, function rooms, a café, and apartments utilized for the KW Residencies—the institution’s art residency program. Recently, KW has begun engaging with other Berlin-based galleries and projects such as Berlin Art Week and the Berlin Biennale. As a place for the production and presentation of contemporary art, KW makes it a point not hold a permanent collection of its own, instead relying on its flexible and enigmatic mixed program of exhibitions, film screenings, lectures, and presentations. 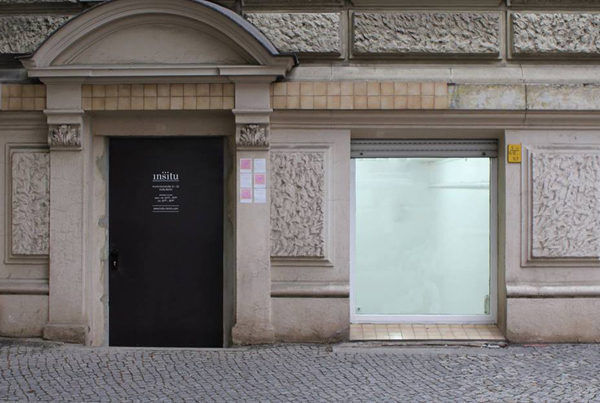 As one of the more long-standing contemporary art institutions in Berlin, it is one of the city’s cultural weathervanes, with its curators consistently engaging with the complex conversation surrounding the more recent changes to Berlin and continuously questioning the practices that lie within the field of art and beyond. One of the city’s most important art venues, Autocenter has left its irrevocable mark on Berlin’s art scene since its founding in 2001 in an auto body shop in the city's Friedrichshain neighborhood by the artists Joep van Liefland and Maik Schierloh (the latter also owns the hip bar ‘Kosmetiksalon Bar Babette’ on Karl-Marx-Allee). Since the space’s inception it has geared its programing towards artistic experimentation, choosing to focus on Berlin’s artistic production beyond the traditional hierarchies of the art market, the confines of curatorial concern and needless economic pressures. 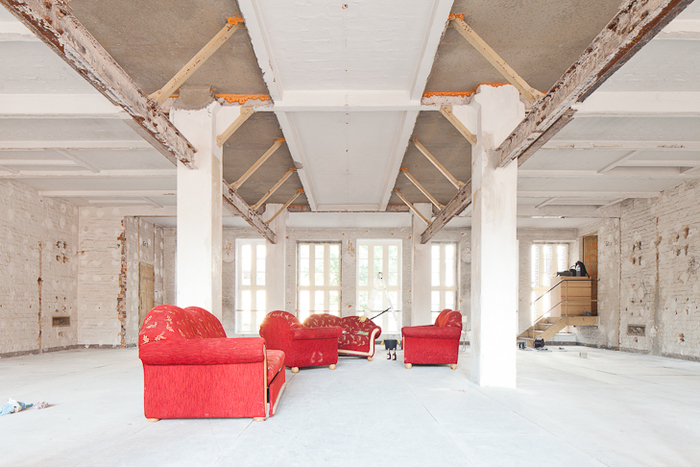 In March 2013, Autocenter moved to its new location—a 350-square-meter former library in Mitte. To mark the shift, van Liefland and Schierloh organized an Autocenter retrospective presenting works by nearly every artist who ever showed at the space. In effect the show catalogued nearly a decade and a half of Berlin art production, highlighting the impact their space’s repertoire has had on the creative topography of the city. An autonomous and dynamic site for high quality artistic experimentation, Autocenter continues to invite international visual artists to exchange and experiment in every segment of the arts. As of 2009, the center began hosting the Summer Academy which, combining practical and theoretical knowledge, hosts a program of educational courses led by internationally acclaimed artists with the express purpose of providing insight into the staging and re-thinking of art. Bringing a democratic method to an art space, the 15-artist group that founded Scotty Enterprises in Kreuzberg in 2006 emphasizes shared efforts through dialogue and consensus for their projects, which focus on contemporary social and cultural-political issues. Already freed from commercial constraints with their non-profit status, Scotty promotes a non-hierarchical and self-autonomous structure, a collaborative style that’s deliberately open-ended for much of the process, though ultimately determined by collective agreement. Not tethered to a specific agenda or dogma, the group rather prefers their inherent diversity to naturally guide and propel the creative development. This technique is exercised for all the exhibitions they curate together, which range from ‘intermedia’ and interdisciplinary solo and group exhibitions to performances and film evenings. Taking their philosophy of collaboration well beyond Berlin, members of Scotty Enterprises also regularly initiate regional and international cooperation with other project spaces. Openly critiquing Berlin as allowing its famous hedonism to affect its taste in art, SAVVY Contemporary promotes fine and performing arts that specifically address the theme of challenging societal issues, as opposed to pure aesthetics. Citing art historical figures like George Grosz, Max Ernst and Otto Dix, as well as contemporaries like Thomas Hirschhorn, Christoph Schlingensief and Noritoshi Hirakawa, SAVVY argues that Berlin’s conflict-rich past is fertile ground to cultivate intellectual discourse that more thoroughly and meaningfully investigates this topic. Practicing a self-titled ‘trialogue’ concept for all their bi-monthly exhibitions, SAVVY’s art direction begins each project by selecting a curator, who is then instructed to invite one artist from North America or Europe and another from South America, Africa, Asia or Australia. Between the three of them, an exhibition and corresponding publication evolves from an open confrontation of cultures. 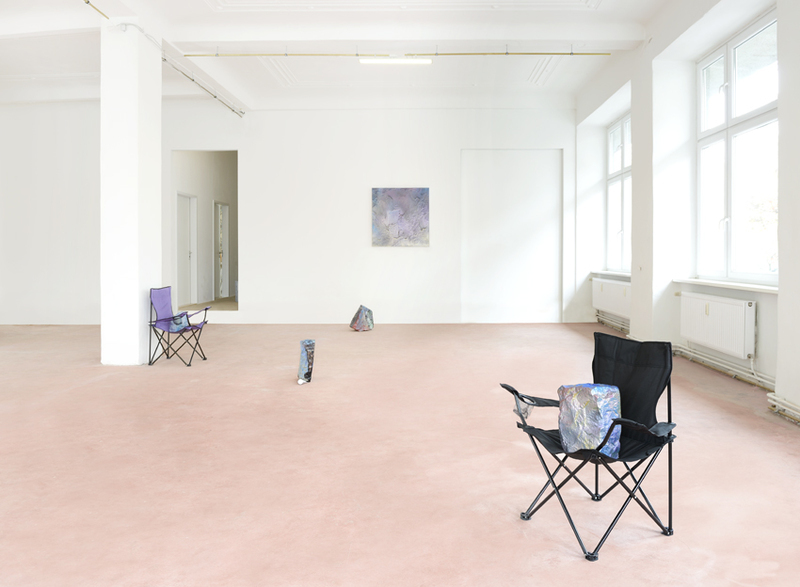 Founded in 2010 by curator Bonaventure Soh Bejeng Ndikung SAVVY Contemporary proudly claims the diverse district of Neukölln as its place of residence, situated near the historic Richardplatz at Richardstrasse 20 in a former electrical station. Sandwiched between restaurants, bars and shops on one of the most trafficked streets in Kreuzberg, SOX is easy to miss if you aren’t looking out for it. A self-proclaimed “alternative showroom in public space”, Sox (formerly sox36) is the smallest artist run non-profit project for contemporary art listed in Berlin and to the uninformed eye, it might look like just another crazy window display on Oranienstrasse. Measuring 225 cm n height, 300 cm in length and 60 cm in depth, it is made up purely of a street-facing vitrine. While this location has been in use for art projects since the 1980s, current directors, artists Alexander Wagner and Benedikt Terwiel, have been managing the space since 2010. 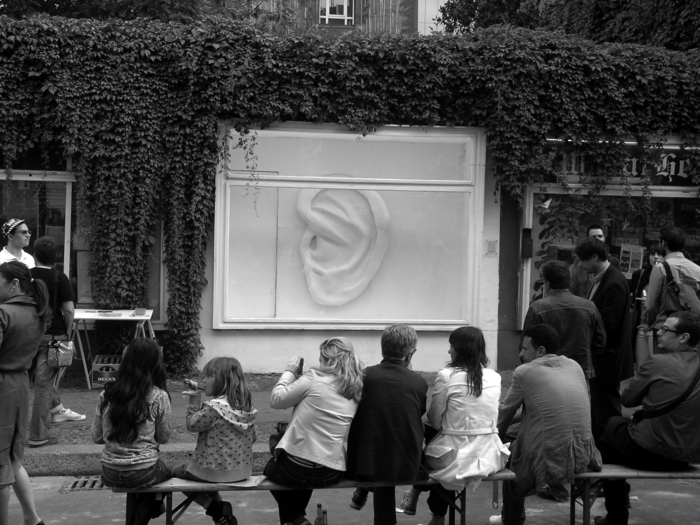 Far from the traditional way of consuming and experiencing art, exhibitions specifically designed for the window rotate every 6-7 days surprising and engaging passersby with its diverse content 24/7; sometimes catching you completely off-guard, other times pleasantly melding with its surroundings highlighting the importance of its geographical contextualization on the busy street. Without the oft-uncomfortable atmosphere of a gallery the window invites casual glances or long pronounced stares. Calling “Kreuzkölln” home—the hip region with oft-disputed borders between Berlin’s Kreuzberg and Neukölln districts— SomoS is a non-profit that’s equally engaged in a number of cultural territories. With a mission to create an international open platform for innovative arts, exhibitions, performances, research, workshops and education, the arts center and residency stands out for its multidisciplinary approach. From its 400 m2 space on the first floor of an 1890’s mixed residential and commercial building at Kottbusser Damm 95, SomoS fills the void left by Kunsthaus Richard Sorge, which occupied the same location from 2008 to 2011. 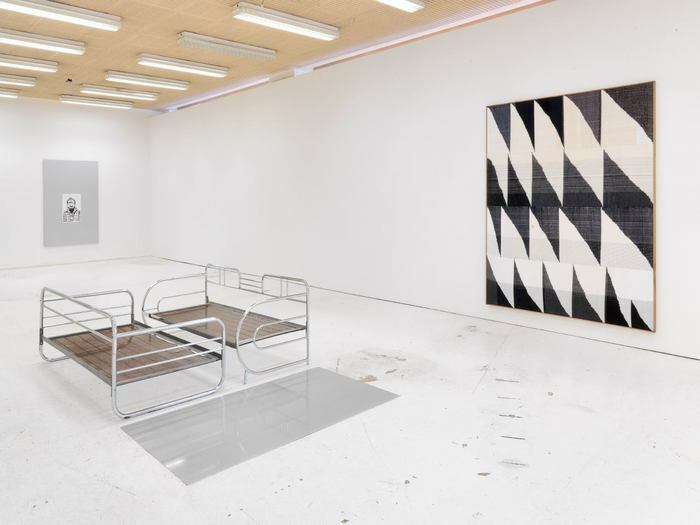 Continuing and expanding on the duties of the former tenant, SomoS works in close cooperation with visiting artists, organizers and curators to realize their projects in a way that goes well beyond the offerings of a typical gallery. Non-commercial art space insitu has been leading the charge in highlighting alternative venues and project spaces in Berlin. 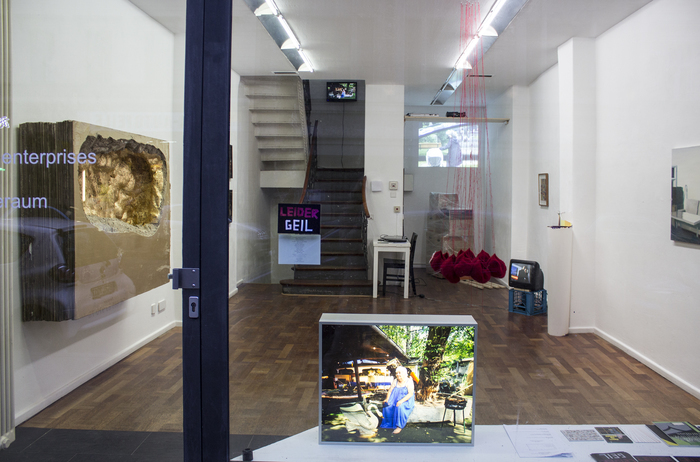 The two-room souterrain space on Kurfürstenstrasse in Schöneberg is run by curators Marie Graftieaux, Nora Mayr, Gilles Neiens and Lauren Reid. Founded in 2012, the name insitu refers to the team’s understanding of curatorial practice as being the location or place of cultural, social and geographical spaces. The team at insitu designs their program around the concept of cycles, which provide a thematic focus and ability to structure presentations around a single topic per cycle. Past cycles have investigated questions surrounding new formats of exhibition concepts, the production of art, and topics relating to relationships, networks and connections. In 2014, insitu shed light on Berlin’s independent art scene by initiating the Project Space Festival, a festival comprised of one-day-only exhibitions led by participating alternative art spaces. Together the festival program provides a glimpse into the culture of the city’s independent scene as one typified by experimentation, dialogue and community.